Quinn is a remake of the most addictive puzzle games ever created—Tetris. Beguilingly simple, this classic 2-D game features geometric shapes which descend from the top of the screen. You have to rotate and position the falling blocks to form complete rows and earn points. Fail to create complete rows and the blocks pile up, leaving you less room to maneuver. The longer you hold out, the faster the game gets. 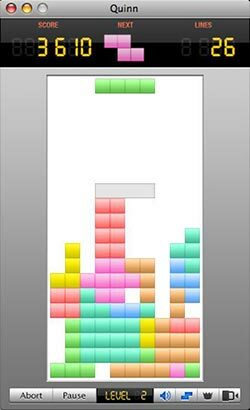 Quinn certainly isn’t the first Tetris clone. But whereas most Tetris knock-offs have tried to muck around with the basic rules of the game, Quinn sticks with the idea that if it ain’t broke, don’t fix it. The developer intentionally sticks as close as possible to the original formula while adding a few nice touches. For one thing, the game that looks and acts like a Mac OS X game should. You can customize the puzzle pieces or background graphics simply by dragging and dropping images into the playfield area. In addition to the graphics included with the game, you can also download new graphics from Härtel’s Web site. Created by a variety of artists, the graphics range from mild to wild—everything from a nighttime cityscape to a spooky gothic theme complete with skull-shaped blocks (my particular favorite). You can edit keyboard settings to create your own control configuration. Härten has also pre-configured Quinn with settings suitable for laptops and numeric keypads. If there’s more than one Quinn player on your local network, you can join or host games via Bonjour, the zero-configuration networking technology built into OS X. Quinn also has a game finder and chat function. However, there’s no master server, so if you want to start a multiplayer a game beyond your local network, you’ll need to know the player’s TCP/IP address. When playing over a network, you can require a password before others can access your server. You can also set up how the winner of a multiplayer game is determined (for example, one with the highest score, the longest average play time, the highest average score, or the most lines per minute). Quinn isn’t particularly robust when it comes to sound effects, and there’s no soundtrack. But that doesn’t detract too much from an otherwise fun game. Especially one that is free. Quinn isn’t Tetris reinvented, but it is a solid OS X game with some great embellishments, such as network play and customizable graphics. Best of all, it doesn’t cost a dime.